Each person spends one third of their life on average on their sleep. Sleep is very important for our body, because thanks to it we regenerate our mental and physical powers. Healthy sleep is conditioned by relaxation of the spine, joints, muscles and internal organs that affect important vital functions. It is necessary for the spine to be supported in its natural shape during lying. In general, the principle is to keep the spine in plane when lying on the side. Thus, the intervertebral discs can become loose and there is no deformation and subsequent back pain. The quality of sleep depends on choosing a suitable mattress and base. Too hard mattress could deform your spine as well as too soft one. When choosing a mattress, we must not forget for what load the mattress will be used. All of our mattresses are marked with maximum load capacity. Mattresses are best laid on a wooden or slatted base. The solid board as a base is definitely not suitable. Solid bases that allow at least ventilation are better . From a health point of view, however, doctors recommend slatted bases, especially those that can offer firmness control in various zones as needed. The most important thing on the bed is not what we see at first glance, but what is hidden to our eyes: the base and the mattress. It depends on their quality whether you are going to jump out of your bed and feel fresh in the morning or whether you get up tired and feel absolutely whacked. Once you start talking about problems with your back, you can bet that most people will join you. Cervical spine, lumbar spine, intervertebral discs... We do not move enough and we do not want to invest too much in the quality lying area or we are not able to make the right choice. The mattress needs to be changed about every seven years. There is no uniform recipe for the right bed. It has to be tailored to each user, especially his/her weight and height. It also depends on his or her health and sleep habits. Someone prefers softer, someone harder bed. But we should not try to spare on high-quality bed. The skeleton of the bed is the basis, into which we place the base and the mattress. There are a number of mistakes when creating a lying area. The minimum length of the bed should be equal to the user's height plus 20 cm (approximate foot length). The width of the lying area should be at least 90 cm. Manufacturers are now able to supply a bed, base and mattress of any size. The bed height with the mattress should be 45 - 55 cm. Another important thing on the bed is the height of the sidewall. If we choose a bed, we should know what base and mattress we are going to put into it. The base with the mattress should not be embedded too deep in the frame to prevent the edge from hurting you. On the contrary, the base that would protrude would be unaesthetic and the mattress would not be sufficiently fixed. The double bed should have two separate bases and mattresses. In order to have the mattress suitable for both partners, they would have to be equal, not only in terms of height but also in terms of weight distribution. Due to the fact that one usually rotate up to 80 times during the night, the overturning of the partner is sensible and undesirable. And what about the headboard of the bed? Thanks to the headboard at the head of the bed, our pillow does not fall down on the floor and we do not feel air draught on our head, however, it is not so necessary at the foot, especially in a small bedroom. When choosing a mattress, we need to know which base we put it on, because not every mattress is suitable for every base. Straight solid board does not guarantee such airiness as slatted bases. When choosing the slatted bases, make sure that the gaps between the slats are not too large. This could cause deformation of the mattress. The maximum gap spacing should be up to 4 cm. For slatted bases, a larger number of slats is desirable to ensure that the base provides sufficient elasticity, durability and that the mattress does not deflect completely. Some types of the slatted bases have orthopaedic properties. They are reinforced with a double slat, have a shoulder cradle, they are adjustable and can help to the overall correct posture and highlight the anatomical parameters of the zone mattress. Greater comfort provides a base with movable slats mounted in movable plastic or rubber bushings. Depending on the load, the slats move and rotate in the joints, and thus ideally adapting to the shape of the body. The quality of the base also depends on how the slats are attached to the frame. It is thus possible to adjust the flexibility of the slats according to the weight and wishes of the user. If we read in bed and need to support the back or we want to relieve tired legs, we select the positioning slatted base. The simpler version of the base has only mechanical positioning for the head and legs, but the most popular model for maximum comfort is the motor base including the fixed or remote controls. The mattress quality is usually a separate story - it is often old and deformed, or also too soft or too hard, rarely forming the "right pair" with the base. The most important parameter when choosing a mattress is its firmness. It is always advisable to tell the retailer what mattress you are currently using and whether you have any health problems (back, sweating, allergies). However, no mattress can heal; it only contributes to healthy and good sleep. Therefore, when choosing your mattress, it is better to listen to your doctor's advices instead of having only the retailer as an advisor. Each mattress is intended for a different user. They are divided according to the material used and their firmness. It is also important to consider what the mattress base will be. Producers indicate the mattresses by their maximum load capacity. A popular choice is cold foam zone mattresses. Cold foam is made up of cells with thicker walls, thanks to greater pores; it is perfectly aerated and dissipates heat much better. We offer five- and seven-zone mattresses, as each part of your body requires a different firmness. While beneath your shoulders you will appreciate the softer zones, under your lumbus you need to have a stronger base. These mattresses are ideal in combination with lazy foam that prevents bedsore. Its firmness varies according to temperature, softens in contact with your body and reduces the back pressure due to the so-called slow return effect, thus preventing bedsores. A suitable solution is to shape the lazy foam into so-called protrusions that lift up the cover and help to make the mattress perfectly airy. Another solution are transversely inserted rollers which, due to their various firmness, properly support parts of your body and, in addition, maintain the mattress flexibility. Cold foam mattresses are suitable for all types of slatted bases offered by us. Latex mattresses are also very popular to ensure proper body support. Latex foam is comfortable, durable and has a very high elasticity; it is flexible and shape-stable even after many years of use. After compression, it quickly returns to its original shape. Latex foams produced by Artilat-Vyrolat contain the maximum possible proportion of natural rubber. Latex is resistant to mold and bacteria, does not exceed the EUROLATEX (West European Environmental Standard) limits. Artilat-Vyrolat products have been awarded the Öko-Tex Standard 100 certificate. Sandwich latex mattresses are available in combination with a core of bonded polyurethane, with coconut or a cold foam core. By combination with a core of hardened polyurethane, foam core or coconut, we increase the overall firmness of the mattress. The airiness of profiled mattresses is ensured by transverse air ducts. By their structure, these mattresses belong rather to a group of harder mattresses. For the Agata mattress, we recommend the non-positioning slatted bases to be used. 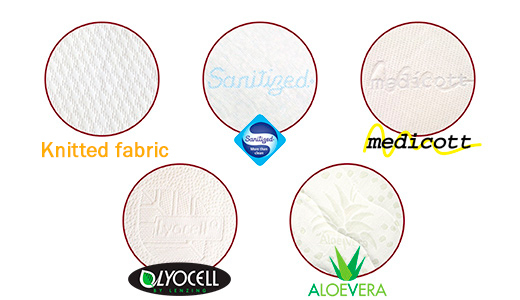 Antibacterial foam prevents occurrence of bacteria and mites. It is dermatologically tested and skin-friendly. Thanks to antimicrobial treatment, the Sanitized is a revolutionary solution for allergic persons. For mattresses, nowadays, accent is put not only on their content but also on their covers. Cover fabrics are mostly manufactured by foreign companies. The fabrics have a standard width of about 230 cm. The fabric is stitched through with hollow fiber of various weights. Non-woven fabrics are used for lining. Such treated fabric is prepared for production of the cover. A great deal of popularity was achieved especially with washable covers. Brands such as SilverGuard, Medicott, Aloe Vera and Lyocell have a special knitted finish that protects against mites and bacteria without any chemical ingredients. In addition, they remove moisture from the body, dry out quickly and they are pleasant to touch. The use of a mattress protector is an advantage. It is usually made of the same materials as covers. The protector protects the cover but also the mattress itself. All the covers we offer are washable at 60°C. For easier washing and handling, the cover is divisible in two parts. The last, but not with regard to the significance of sleep, is the choice of a pillow. It is sometimes too big, or two pillows are used unnecessarily, but it does not perform a function of proper support of the cervical spine because it only raises the head up. On the contrary, it hurts by this! When lying on your side, the spine should be in the plane from the neck to the buttocks. While lying on the back, the spine should be in its physiological shape. Company DŘEVOČAL s.r.o. offers anatomically shaped pillows that suitably support your cervical spine. To make the rest in bed perfect, we must not forget the high-quality quilt and pillow. The quilt must be long enough, the size of the pillow depends rather on habits of each sleeping person. Someone does not let go of the classic feathers but has some disadvantages - the feathers have to be cleaned after a while and not suitable for allergy sufferers. Another option is the sheep fleece recommended for rheumatism sufferers. The modern filling of quilts and pillows is a hollow fiber that perfectly replaces natural fibers. Its advantages: it is lighter than natural fillings, it warms up excellently, it is suitable for allergic persons and can be washed. Pillow filling can be formed by continuous hollow fiber layers or "balls", which, by adding or removing, create a fuller or thinner pillow. Now we shall "dress up" our perfect bed. For example, we have classic crepe, cotton, satin or flannel available. The priority is that the bedding is not only pleasant to the touch but also easy to maintain. Customers can choose from plenty of designs and colors.